McCaskill: Is USPS undercharging FedEx and UPS? WASHINGTON – U.S. 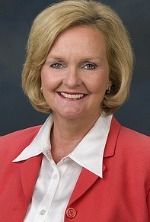 Senator Claire McCaskill today questioned the U.S. Postal Service’s pricing for its “last mile” of delivery in rural areas, and why she believes it may be losing money by under-charging competitors such as UPS and Fedex to carry mail to those areas. In 2014, McCaskill asked the Government Accountability Office to look at these agreements, and the agency confirmed some of her concerns when they discovered the Postal Service wasn’t accounting for key cost-drivers such as package size and weight when making agreements, and wasn’t collecting some of the revenue it was owed from the deals. McCaskill, a longtime advocate for postal service in rural communities, is widely credited with having waged a successful campaign over several years to save rural post offices and maintain delivery times when faced with closures and the slowing of standards. McCaskill recently backed the Rural Postal Act, a bill that aims to improve postal service, delivery times, and standards in rural communities that have been disproportionately affected by cuts to the Postal Service. The bill—sponsored by Senator Heidi Heitkamp of North Dakota and also cosponsored by Jon Tester of Montana—would restore overnight delivery, return a faster First-Class mail standard, make six-day delivery permanent, and enact strict criteria the Postal Service would have to meet before closing a post office to ensure that rural communities are still able to easily access the mail system. Last year McCaskill requested an examination of the interaction between the lack of adequate access to broadband technology in rural areas and the reliability of Postal Service delivery. Without efficient and effective mail service as a result of recent Postal Service consolidations, rural Missourians are put at an economic and communications disadvantage, the effects of which haven’t yet been properly studied. McCaskill also recently signed on to a request for the federal government’s top watchdog to review the Postal Service’s calculation of delivery times and standards, and she helped win a one-year moratorium on postal closings until the impact of those closings is fully understood. You go, girl! For too long the machinations of postal management has been secretive and opaque. Let some light into this room and let the truth be told.